Confucius, kung-fu, yin and yang, capitalist communism: China is a land full of mysteries and contradictions. Often associated with cheap imitations, China now produces technology and internet startups that can rival anything in the West. The Chinese search engine, Baidu, is no exception. It bears many similarities to Google and Bing, but can also boast its own unique innovations. This is why search engine optimizers across the globe are interested in Baidu. However, much of what is reported about Baidu SEO is not true, was never true or is no longer true. 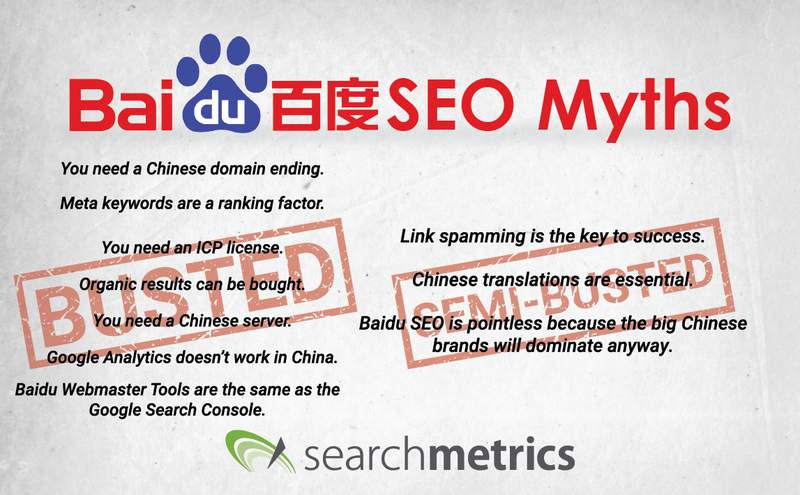 Here, I will debunk some Baidu SEO myths – and possibly reveal the truth behind a few of them. 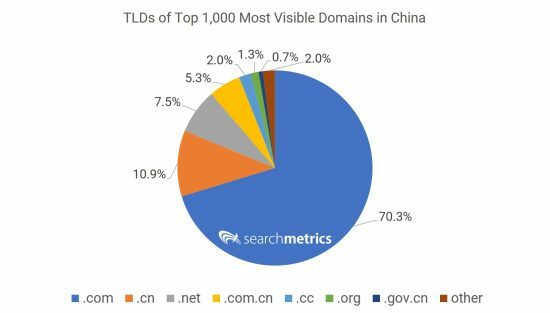 Amongst the top 1,000 domains in China with the highest SEO Visibility, there are more with the TLD .com than there are with .cn and .com.cn put together. What is true is that Baidu has warned against the use of unusual TLDs. These are often cheaper than .com, .cn or .com.cn, making them more attractive for spammers. As a result, Baidu says that domains with unusual TLDs can earn less trust. Even without Baidu’s warning, any good UX expert would advise against using an unfamiliar TLD, as this can raise suspicion among users. Any foreign domain sticks out like a sore thumb. 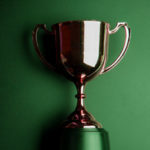 The result will be a lower click-through rate that will, in turn, lead to a decline in the ranking position. BUSTED: You can run a successful website in China without a Chinese domain ending. Many web designers still like to meta keywords to optimize websites, and many hobby SEOs are convinced that meta keywords are essential when optimizing for Baidu. However, what stopped worked a long time ago for Yahoo and Bing and what never worked for Google, has now become irrelevant for Baidu. Two years ago, Chinese SEO experts did recommend using meta keywords. For a while now, however, SEOs in China are certain that Baidu no longer looks at meta keywords (see also this discussion (in Chinese)). BUSTED: Meta keywords are not a ranking factor for Baidu. The Internet Content Provider (ICP) License is issued by the Chinese government to companies registered in China. It is supposed to guarantee that websites only publish content that does not harm the people of China (broad generalization and personal interpretation of the author). Although an ICP License offers a number of benefits and does create further ranking advantages on Baidu, the license in itself is completely unnecessary. A website does not need it to be indexed and ranked by Baidu. BUSTED: The ICP license is not essential for Baidu rankings. One rumor that persists is that places in the organic search results can be purchased. Not a single Baidu SEO workshop goes by where I am not asked this question. The fact is this is nothing more than a rumor. Baidu can manually tinker with search results and exclude or de-index certain URLs, but this only tends to happen if pages that are not politically or socially acceptable are ranking too high. Leveraging personal contact with Baidu staff is also not advised. Any employees would risk losing their job or criminal prosecution if found to be involved in the manipulation of results. BUSTED: The only search listings you can pay for are Baidu ads, not organic results. Like other modern search engines, following Google’s lead, Baidu has established backlinks as the ranking factor. Just as Google could, in the past, be manipulated by the excessive placement of links, Baidu is not immune to link spam. So you could say that there is some truth to this myth – Baidu can be manipulated by artificial link-building. But beware! Just as Google’s Penguin updates wreak havoc in the Western SEO world, Baidu also rolls out updates at irregular intervals that are specifically designed to punish spam. SEMI-BUSTED: Sooner or later, link spam is likely to lead to punishment by Baidu. Good Baidu SEO should strive for earned links and links that genuinely help the user. When setting up the hosting for a Chinese website, I recommend using a Chinese web server or a good Content Delivery Network service with servers in China. However, a Chinese server is not essential when looking to be indexed by Baidu and achieve high rankings. The big difference is that a website hosted and run from China is often significantly faster than a website hosted elsewhere. This is not only because of the distance, but because of the “Great Firewall of China”, which can often severely slow down websites hosted abroad. BUSTED: Having a Chinese server is not a requirement for high Baidu rankings, provided the website loads quickly enough in China. A common approach to the internationalization of a website is to simply provide an English version. This is lazy enough for Google UK or Google US, but it is even less effective when looking to rank well on Baidu. Even Chinese-language versions often fail to include the right terms for modern Chinese culture when talking about – and when trying to sell – a product. A literal translation may not transport the intended messages. We have all seen what happens when English translations of Chinese product texts are not checked by a native speaker. Simply translating texts is therefore not a worthwhile investment of resources, and will have little or no positive impact on impressions in the Baidu SERPs or traffic. Instead, you need Chinese native speakers who are familiar with modern culture and language. They should understand your message and your products, and communicate them to the Chinese target audience. Which needs, which problems and which expectations do Chinese consumers have that your products can help with? 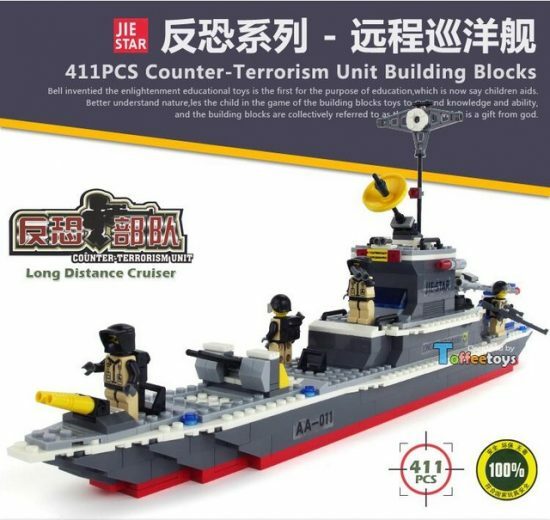 You have to consider how your product differs from the (Chinese) competitors, as a product’s USPs on the Chinese market will likely differ from those on Western markets. Several Google services, including search, are blocked in China. But some Google products are available. In China, it is primarily services that spread uncontrolled or false information that are clamped down on. For this reason, Google search and social media sites like Facebook and Twitter are unavailable to the public. On the other hand, services that do not leverage user-generated content, like Google Translate or Google Analytics, can be used in China without restriction. 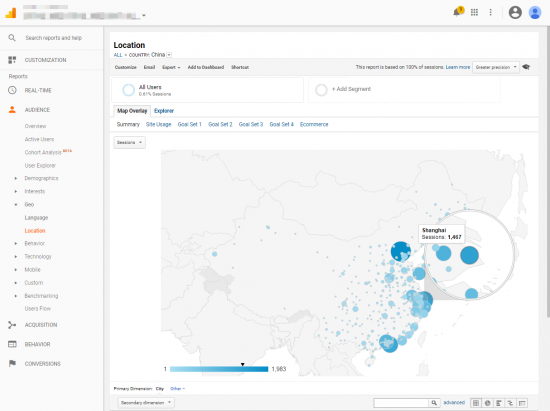 Google Analytics tracking codes work flawlessly and track Chinese users just as well as they track American users. 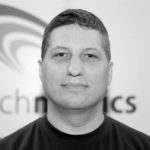 One problem is accessing the Analytics front-end, as this is provided via the same root domain as Google search. The “Great Firewall of China” does not distinguish between different Google services, but this does not mean Analytics is prohibited – it just means it would be too much effort determining which Google services are good and which are bad. BUSTED: Google Analytics can be used for Baidu, provided the data analysis is done outside China or via VPN. For Google SEOs, the Search Console is a genuinely helpful source of information, and can sometimes prove to be an extremely valuable tool, but Baidu Webmaster Tools are (IMHO) much more powerful for people implementing Baidu SEO. As a small example, Baidu can be very slow to interpret 301 Redirects after a webmaster has adjusted or forwarded URLs. It can sometimes take months and lead to great losses in visibility before Baidu notices the changes and reflects them in the search results. This is even more frustrating when migrating a domain. Baidu Webmaster Tools can provide assistance with this, because they include the possibility of informing Baidu about concrete URL changes. BUSTED: Registering a website with Baidu Webmaster Tools is essential for Baidu SEOs. 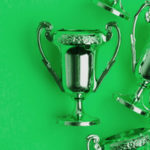 With Bing and Google, smaller websites have a chance of ranking on the first results pages for high-volume keywords, provided they can demonstrate a high level of relevance or specialization. 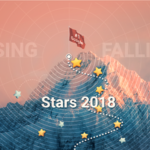 Unfortunately, this can prove extremely difficult with Baidu, as top rankings for highly competitive keywords are often only available to the giants of the Chinese digital market – not uncommonly to Baidu itself, like Baidu Baike, the search engine giant’s own Wikipedia-style encyclopedia. However, SEO success is possible by deliberately optimizing for secondary and long-tail keywords, thereby increasing visitor numbers through the sheer volume of keyword rankings, and not via the main keywords. Another option is to look at alternative sources of traffic, such as the Chinese social networks, Weixin (WeChat), Weibo and QQ, discussion forums and direct alternative sales channels like Taobao and T-Mall. SEMI-BUSTED: Baidu SEO strategies can work for smaller sites if they focus on long-tail keywords. SEO is possible in China. SEO is different in China. But many of the things that people think they know about Baidu SEO are only loosely based on truth, either stemming from superficial observations (with no real evidence) or are passed on uncritically around the community, and often garbled, almost like a game of Chinese Whispers. Disclaimer: This article on Baidu SEO myth-busting is largely based on my own experience or on the experience of my Chinese colleagues. It is possible that your observations are different. 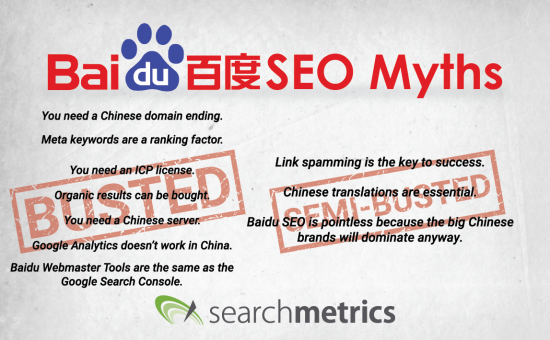 Which myths have you heard about SEO for China? Which myths have you never believed – which do you think could be plausible? Which of the myths I’ve listed would you like to believe? Or maybe you don’t have any option but to believe them? I don´t see the baidu, here on Brazil no have nothing about or people using it. i like to know if have ads, but to comercialize produtocs to chine if is possible on baidu? yes, Baidu offers paid ads similar to Google Adwords. You can use this service to offer commercial products to China. But if you are serious about that, you should find a good Chinese local agency, which can support you with Taobao.com commerce. Setting up a store on Taobao.com and selling your products on this shopping platform, which is probably China’s most popular one.